Ontario 49 is one of Canada’s biggest lotteries, offering fixed CA $2 million (€1.34 million) jackpots, great odds, and seven enticing prize tiers. While its format is very straightforward, the game also offers players a few options that make playing it even easier and more enjoyable. Curious in learning what these are? Then read on, as we go over them and much more below. In order to give residents of the Canadian province of Ontario some fresh lotto excitement, the Ontario Lottery and Gaming Corporation (OLG) developed Ontario 49 and held its first draw on October 1, 1997. Although its jackpots have gradually increased since then, the last time they were increased (to the $2 million the game offers today) was May 2014. That same month, new prize tiers were also created, and the overall odds of winning a prize increased from 1 in 54 to 1 in 6.6—a world of a difference. The other rules of the game have mostly remained the same since its inception, but in January 2008 it became mandatory for players to have to sign their tickets before retailers could validate them. As a result, the physical tickets nowadays have a space on the front of the ticket for the player’s printed name or signature. This not only protects the player’s investment but also reduces a lot of hassles for the OLG. Proceeds from OLG go to the Province of Ontario’s Consolidated Revenue Fund, which then disperses them to hospitals, sports, various cultural activities, and many charities and non-profits within the province. Ontario 49 uses the popular 6/49 format that quite a few other lottery games around the world, including Canada’s very own Lotto 6/49, use. Playing the game involves choosing 6 numbers from a range of 1 to 49, as well as one bonus number. You can choose your own numbers or you can opt for the Quick Pick option, which will automatically generate a set of numbers for you. If you match all 6 numbers, you’ll win—or at least share—the jackpot. The bonus number only determines the second and sixth prize-tier winners. Speaking of prize tiers, the first and second ones are both shareable tiers, meaning that they will be split evenly among all of the people who win them in each draw. However, since the game costs only $1 to play (officially within Canada), it still offers great value, regardless if these prizes have to be shared or not. Combination Play allows players to combine 5, 7, 8, or 9 numbers from the 1 to 49 range, and these will be sorted into different six-number combinations. If any one of these combinations matches the numbers that are drawn, you win. Though this option costs considerably more than a single play, it’s a great way to boost your odds of winning an exciting prize. Advance Play is basically a subscription, which many third-party online lottery sites offer as a staple feature. The Ontario 49 Advance Play lets you prepay for 26 consecutive weeks of draws in a row so that afterwards you can just sit back and wait until you get a win. Encore is a bonus game that, within Canada, costs just $1 more and gives players an opportunity to win an additional CA $1 million (€669,000) that’s completely independent of Ontario 49’s regular prize pool. On a side note, this game is also available with Lotto 6/49 and Lotto Max. The likelihood of winning Ontario 49 is 1 in 13,983,816, which are quite good odds compared to many other major lotteries around the world. And when you factor in that the overall odds of winning any prize are 1 in 6.6 and that you can win a prize just for matching two numbers, then Ontario 49 looks even better. Sure, the game’s fixed jackpots (see two sections below) aren’t the biggest, but they are still respectable. Other lotteries with identical odds include Canada Lotto 6/49, Polish Lotto, and Spain Bonoloto. Meanwhile, a few games that have even better odds are Austria Lotto (1 in 8,415,060), Hungary Hatoslottó (also 1 in 8,145,060), and UK Thunderball (1 in 8,060,598). The Ontario 49 draws take place in Toronto every Wednesday and Saturday night shortly after the ticket purchase cut-off time of 10:30 pm EST. All prizes must be picked up within 12 months of the draw, and those that are not are released back into the prize pool. Since the Ontario 49 jackpot cap is set at CA $2 million (€1.34 million), this is the most that anyone has ever won through the game. However, quite a few people have won—or shared—this amount since 2014, when the jackpot was last increased. While none of these winners rank among Canada's biggest lotto winners, one thing is certain: their windfalls changed their lives forever. 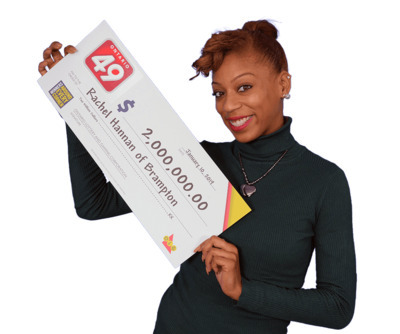 Since the jackpot prize is fairly small compared to other national lotteries, Ontario 49 offers no annuity option. Therefore, all prizes are awarded as single lump-sum payments that are officially issued by cheque. Canada is one of those lovely countries that doesn’t tax lottery winners, so everything you win is exactly what you’ll take home and keep with you—provided your country doesn’t charge lottery wins either. If it does, then you could still be taxed when you transfer the money back into your local bank account. If you’re not sure, then this is something worth looking into so that you don’t encounter any surprises later on. 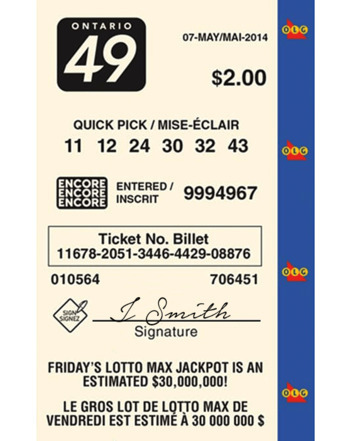 Normally, the only way to purchase Ontario 49 entries is from one of the more than 10,000 lottery ticket retailers across the province of Ontario. Tickets to this lottery aren’t even sold in other parts of Canada. Luckily, some of the best online lottery websites allow you to purchase official Ontario 49 tickets or bet on the outcome of its draws. This means that you can play the game, as well as Canada Lotto 6/49 and Lotto Max, even if you never physically step inside the country. How’s that for convenience? Ontario 49 – Is It Worth Playing? While Ontario 49’s $2-million jackpots might not rank among the world’s biggest, knowing that they’re fixed and available twice per week, every single week, is quite reassuring. On top of that, the odds of winning them are great, as is the fact that you can win a prize just for matching two numbers, and the $1 entry price offers tremendous value. No wonder more than a quarter of Ontarians love playing this game every week! My wife and I lived and worked in Toronto for many years before retiring to Florida, and Ontario 49 had a big impact on our life. While we didn't win the $2 million, we did win $50,000, which helped us pay for our grandson's university and the rest of the mortgage on our cabin. In a way we kind of feel indebted to it, so it's nice that we can still play it abroad it. Hopefully one of these days we'll actually win the jackpot!